My story begins January 6, 2000 when Mr. Clyde A. Harbin Sr. visited by Antique Fishing Lure Website and sent me an e-mail telling me how much he enjoyed it. Being a lure collector and an owner of his James Heddon's Son's Catalogues book I knew immediately by his e-mail name that this was the Famous BASSMAN. I was extremely excited and honored that Mr. Harbin had taken the time to send me an e-mail. Shortly we started to converse back and forth, sometimes three or four times daily. We have become very good lure collecting friends and we communicate often. He has supplied me with material of his work and his years of research and compiled them together into book format. These hand assembled books took him decades to complete and because of Mr. Harbin's expertise I am able to find answers to questions and piece together pieces of the puzzle. After I started to read and study Mr. Harbin's books and material I was intrigued by his accomplishments and involvement not only in the tackle industry but also as a very successful business man. I became interested in his work and the 30 years of research that he did on James Heddon. I decided to do my own research on The Bassman and write this page. Clyde A. Harbin Sr. was born on January 15, 1916. 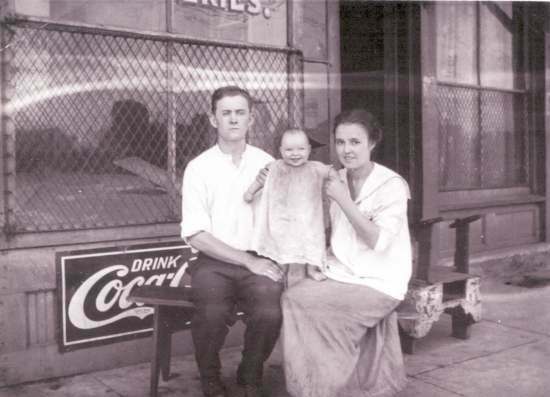 The small child in the picture is Clyde when he was one year of age with his father, John Clyde Harbin Sr. and mother, Emma Rose Harbin sitting in front of their Cash Grocery Store. Their store was located at 121 East Iowa St. (now Crump) at the end of South Main St. in Memphis, Tennessee and today this location is a vacant lot. Shortly after this picture was taken they moved to northern Mississippi and in 1917 began milking cows and selling the milk to Memphis housewives and stores. They did not bottle the milk at this time the milk came directly out of milk cans into whatever containers were available. On the first Monday in March 1919 John Clyde Harbin, wife Emma Rose Harbin and son Clyde moved to Whitehaven, Tennessee for a better Dairy Products Milk building. In 1920 Clyde's father and mother opened up a "Roadside Stand" which served barbecued pork and hamburgers. This roadside barbecue and hamburger stand closed in 1972. In 1925 an addition to the Dairy business was built a 40' x 108' outdoor public swimming pool. In 1926 a six room Tourist Court was opened which all had inside showers, toilets, electric fans, steam heat and Beautyrest mattresses. Now days this type of establishment would have been classified a motel. Back then the Tourist Court was the only accommodations on U.S. Highway 51 between New Orleans and Chicago. They were so far out of Memphis the electricity had to be supplied by generators. In 1928 they added 48 acres to the original 3 acre Dairy Products grounds. Years later they provided rental lots which had two and three bedroom mobile homes that had electricity, natural gas and water. In 1982 the 65 mobile homes were sold and today's RV park is still in operation. After Clyde's parents passed away he became the second generation to operate the dairy products business. 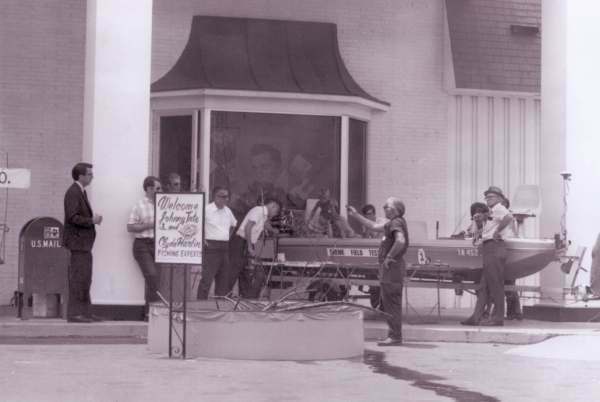 They supplied fluid dairy ice cream and ice milk mixes to Dairy Queen type hamburger and milkshake establishments. Clyde graduated from the Gulf Coast Military Academy in the spring of 1934. The academy was located in Gulfport, Mississippi. After the academy he attended the University of Mississippi and started his studies in pre-legal. Clyde left the university in the summer of 1935 because he decided to work in the various family businesses that now were located on fifty-one acres of farm land. On March 30, 1939 Clyde Harbin married Ellie Polk Bailey of Tunica, Mississippi. They had three children together, two daughters and one son. She also was a good bass fisher person, she had a 13 pounder to her credit while Clyde had a 10 1/2 pounder. Mr. Harbin won the above trophy from the 1951 Stuggart Arkansas National Duck Calling Contest. Clyde tied for 4th place in this Duck Calling event. 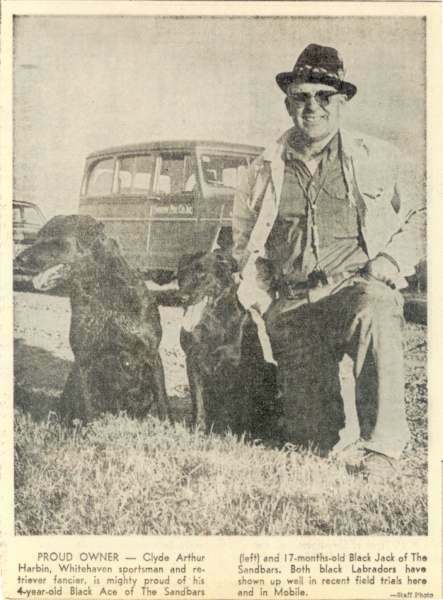 In 1952 Mr. Harbin was the Champion Duck Caller at the West Tennessee Sportsman's Rally. 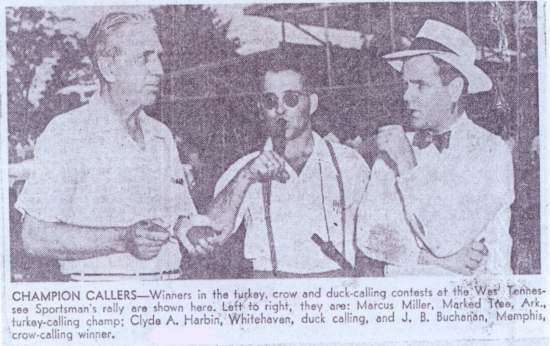 Picture shown left to right: Marcus Miller, Turkey calling champion - Clyde A. Harbin, Duck calling champion - J.B. Bucharian, Crow calling champion. 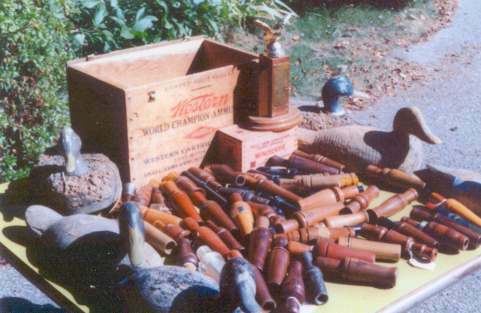 Mr. Harbin's Duck Calling Collection at his home. Starting in 1956 through 1964 Clyde was active in assisting and participating in Retriever Trials in Memphis, Tennessee and throughout the mid-west territory. Mr. Harbin also helped as a runner or as Clyde put it a "Gofer" for the 1960 National championship Stake in Weldon Spring, Missouri. He was invited to work at this National Retriever Field Trial Club Event. As a perk all of the workers were invited to shoot on Mr. John Olin's NILO Game Perserve. I guess Clyde was always interested in fishing lures. He actually began collecting old fishing tackle in 1964 after his dogging days. As the story goes while Clyde along with bass fishing partner Johnny Tate were fishing the Oxbow lakes south of Memphis, Clyde's trusty Heddon Lucky 13 was not working for him that day. His partner said to Clyde I wish I had a Heddon, Basser. Clyde asked Johnny just what is a Basser and his friend explained that it is similar to his Lucky 13 but it has a long low lip, when fished deeper it would swing from side to side and it also could make loud surface noise. A few days later while fishing with friend John Day of Brookhaven, Mississippi Clyde told him of the Basser he learned about. His friend then opened up his tackle box and pulled a Basser from the box and said to Clyde, you mean one like this one? He then gave Clyde his Basser and THUS was the beginning of Mr. Harbin's collecting which eventually led him into his serious collecting and research over the following years. His next lure was a Heddon, Spindiver and at this time he did not know about this lure only that other collectors were trying to find one. He soon found out this was a rare find and it took a special place in his collection. In 1967 Mr. Harbin helped Ray Scott promote his First All-American Invitational Tournament held at Beaver Lake, Arkansas. Mr. Harbin was captain of the Memphis Bassmen Team. He entered the team and challenged Tulsa, Oklahoma and other states that the Memphis Bassmen could out fish them even if it was in their own territory. After making the challenge he also made the Bass Tournament Challenge Rules. The Memphis Bassmen Team did go on to win the tournament and Ray Scott's First All-American Tournament was a huge success. Until Mr. Harbin made the team challenge Ray Scott did not have a lot of success in promoting his own contest. After the challenge was made this boosted the tournament from 35 contestants to 106 contestants. Because of Clyde's hard work and promotional skills, Ray Scott's First Tournament went on to be a success. 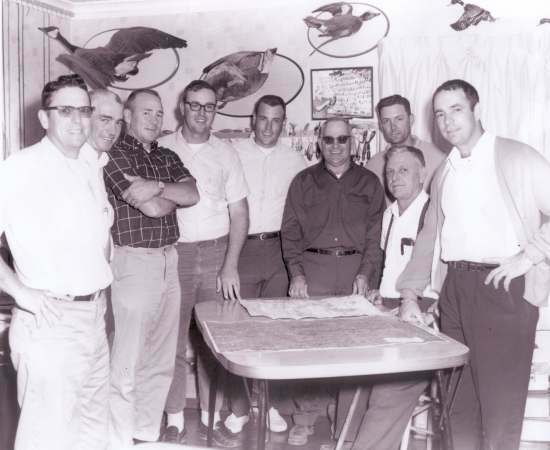 Team Members shown from left to right : Johnny Tate - Paul Childress - Ed Ferguson - Bill Dance - Charles Spence - Clyde A. Harbin Sr. - Dennis Demo - Frank McDougall - Ed Howze. It has been said that Mr. Harbin gave Bill Dance (star of his own TV fishing show) his first commercial start. Clyde helped Bill when he started out making his own rods around the kitchen table. It is possible that if not for Clyde, there would be no Bill Dance TV show and he might still be working as a furniture salesmen. After Ray Scott's First Tournament is when Clyde took on the nickname of The Bassman and soon led him to spend more time fishing and conducting bass seminars for bass clubs and other service organizations. 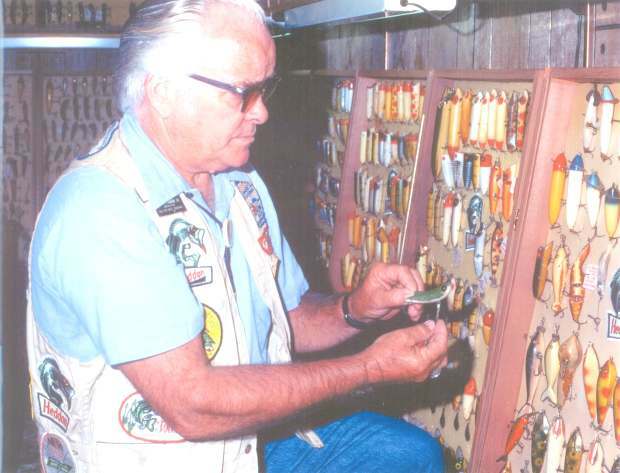 At Lobo's Fishing & Hunting Show in Mobile, Alabama he displayed over 1,800 old lures. He demonstrated many old lures by casting them into a forty foot tank that contained several bass. One day a bass even struck a wooden Heddon, River Runt while he was demonstrating the bait. One of Clyde's favorite baits is the spinner bait and he even designed and marketed one himself called The Bassman Spinner Bait. His spinner bait was proven successful for him as well as many other bass fishermen. His design had modifications from the traditional spinner baits. Also available with his spinner baits were fishing instructions and a tuning "Gizsmo" to tune the bait. 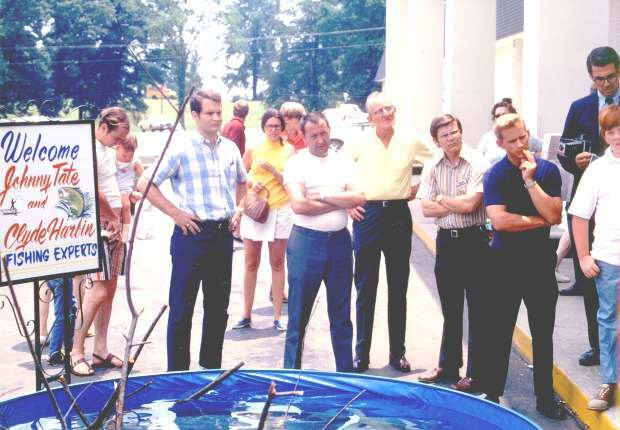 The First Outdoor Bass Seminar given by Johnny Tate and Clyde A. Harbin. 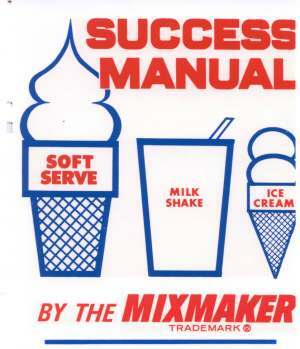 Mr. Harbin wrote and published a Soft Serve Success Manual in 1969. 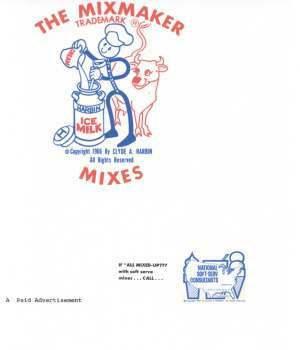 He developed thirteen dairy product trademarks. This manual helped to pinpoint mix problems as to taste/portion controls and sanitizing techniques to comply with the health department requirements. Solving customer's problems is the correct sales modus operand. Years in the Memphis Soft Serve Operators locations gave Clyde the knowledge to publish his Success manual. He also provided a 320 slide Seminar to soft serve operators and ice cream stores. 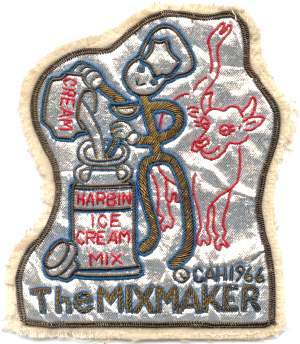 This Mixmaker Patch was made in France. It is hand woven with 22 gold thread and Mr. Harbin wore this very patch on his jacket while conducting his four tray of 80 color slides in the National Soft-Serve School Seminars to operators of Dairy Queen type operations. Clyde has been active in such pursuits as working retrievers, conducting bass seminars, lure manufacturing, special rigging of bass boats, converting vans into campers, presenting soft ice cream seminars and writing and publishing his Soft Serve Success Manual for the soft ice cream industry. Clyde had a strong love for bass fishing and teaching fishermen just how they could put more fish in the boat. 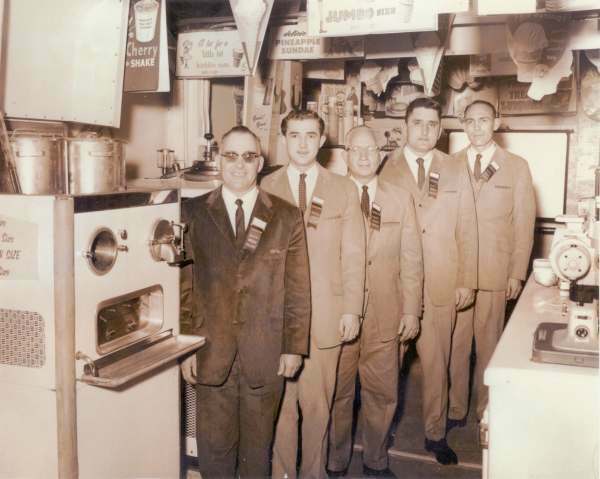 Clyde's Son-in-law, John Doddridge Jr. began too operate the Harbin Mix Business in January of 1966. This would help free up Mr. Harbin so he could concentrate more on bass fishing and conducting more of his bass seminars. This is a picture of the HMCI Soft Serve Freezer and Seminar Station. This is the very room that Clyde had the idea of writing the Success Manual. This photograph was taken October 21, 1971. Shown from left to right are Clyde A. Harbin - John Doddridge Jr. - Cotton Thompson - Buck Hood and Gene Burr. Mr. Harbin was the originator of the Bassmen Consultants and the founder of the Bas-Tek-Neke Seminars. The Bas-tek-neke seminars consisted of an eighty color slide presentation along with a question and answer section. Johnny Tate assisted Clyde with the presentation and helped to answer questions fishermen had about equipment and fishing methods. Johnny Tate was an executive of JT Corporation that was a Memphis firm that engaged in production of sports films and fishing products. The slide presentation consisted of anglers and shots of Clyde and Johnny catching large bass. Mr. Harbin was relatively new to the seminar circuit but his seminar was rated one of the best. Clyde was gathering lures from 1964 until 1976. He began to collect in specific areas around 1976. 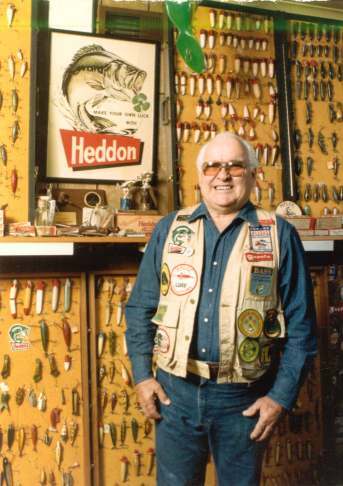 He collected many lures from many different lure company's but Heddon was definitely his favorite. He described himself as a Heddon nut. This was about the same time the National Fishing Lure Collectors Club was organized. 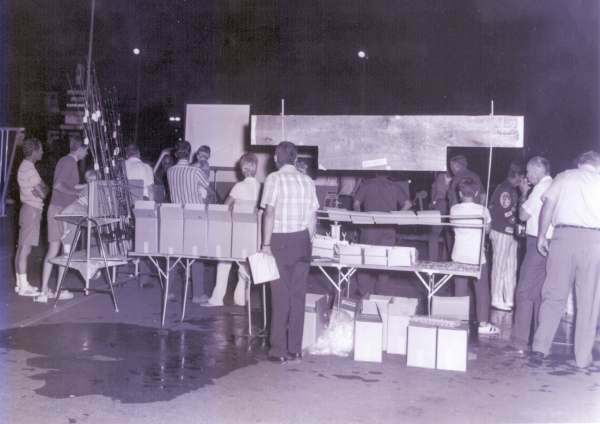 The Charter NFLCC Annual Swap Fest was April 23,24 & 25 1976 at the School of the Ozarks in Springfield, Missouri. Mr. Harbin was involved with the club since the beginning and served on the Board of Directors in the beginning. 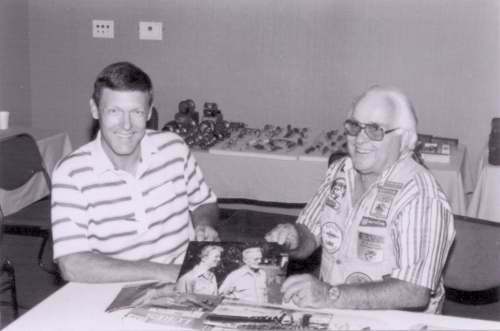 June of 1977 Clyde won the Best Collection Trophy at the second annual NFLCC swap meet held in Dowagiac, Michigan. Clyde always tried to put together information and facts about old lures. At this time there was a lack of printed material and information on old lures. This is when he decided to put together his book titled James Heddon's Sons Catalogues by the Bassman. This was the first book for lure collectors and he had it published in 1977. 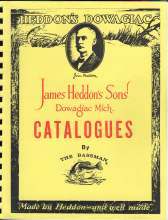 It covered over fifty years of lures and contained copies of Heddon catalogs dating from 1903 - 1953 complete with lures, rods and reels. He was also co-author of this book titled "A Collectors Reference Guide to Heddon Fishing Lures". This book described and listed Heddon lures numerically . 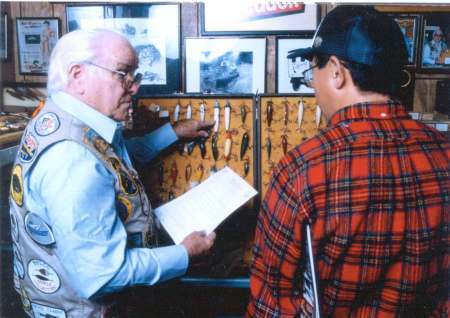 Clyde devised the majority of all the lure abbreviation system which describes lure parts. Collectors, dealers, etc. still refer to this system today. The abbreviations can be used as an aid when describing lures without the aid of a picture. This lure information can be found in the inside cover of Clyde's 1977 publication of the James Heddon's Son's Catalogue book. Mr. Harbin played a large part in helping Carl F. Luckey publish his book "Identification & Value Guide to Old Fishing Lures and Tackle". Mr. Luckey was the writer and Mr. Harbin was the knowledgeable researcher and lure collector with the experience to price the lures and reels for this book. Clyde supplied the lures from his collection, lure patents and lure catalogs for this book and went on helping in the second, third and fourth edition of this book. Clyde is a supporting member for the Outdoor Writer of America Association (OWAA) and the Florida Outdoor Writers Association. He also was a member of the Association of Great Lakes Outdoor Writers and the Tennessee Outdoor Writers Association. He tried to educate everyone on old fishing tackle and hauled his collection to all of these organizations for the state, regional and national meetings. Outdoor Writers Association of America (OWAA) National convention June 18 - 21, 1979 Albuquerque, New Mexico. 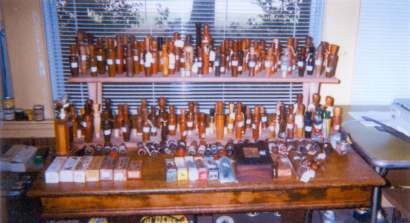 This display was in the registration room and later moved to a separate room where Mr. Harbin presented a color slide seminar named "The Big Bass Caper". 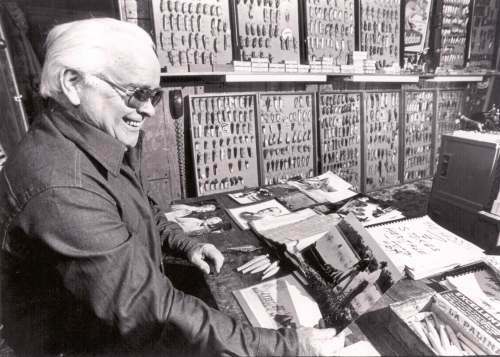 This personal picture of Mr. Clyde Harbin Sr. with a small part of his collection was taken on August 28, 1979. Mr. Harbin is holding his rare and valuable 1898 hand-carved James Heddon Frog. This photograph was published in the 1989 book "The Collector's Guide to Antique Fishing Tackle by Silvio Calabi". 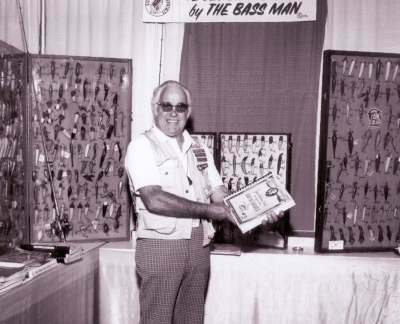 Mr. Harbin's Old Lure Exhibit at the "Big Bass Seminar" in Orlando, Florida on December 8,9 &10 1979. The Big Bass Seminar is a learning session for all anglers and includes presentations by America's leading anglers and fishing biologists. This group also had a steering committee that set up special sessions for ladies and young people to teach them angling success. The Big Bass Seminar's were sponsored by the Florida B.A.A.S. Chapter Federation, the National Bass Association and the United Bass Fishermen. Outdoor Writers Association of America supporting member from 1979 through 2000. This is Mr. Harbin's Tenth Year Button. This is a picture of Clyde taking notes at his desk. His desk top remained the same until December of 1999 when he installed his computer. Take note of all the old lure information books that Clyde had written and assembled. They are stacked double high in milk cases all the way across his desk. 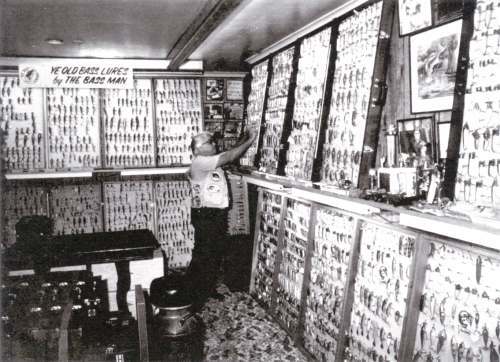 This is just a section of Clyde's lure room when his collection numbered more that 10,000 lures. With no place to display his lures that he contained in boxes Mrs. Polk Harbin agreed to turn their living room into a museum of lures. Clyde stated that he does not want people to get the idea that his collection represents purchases from other people. Along with wife Polk Harbin who is also devoted to the study and research of old lures, together they traveled thousands of miles from coast-to-coast in search of old lures and fishing relics. Clyde was once asked what would have been his most valuable item? After he hesitated for a second he said, well if I had been an owner of one of those 8mm camera's way back I would have filmed the then young Elvis Presley playing ball in the yard next door to my home in Memphis ... and would this piece of film been worth something! In 1986 Mr. Harbin had a quest to obtain historical information of the Heddon/Stokes Family Heritage. On his own he organized an in depth fact finding journey which revealed events that took place about the James Heddon and C. H. Stokes families. This mission ultimately became the foundation for Mr. Harbin's hand assembled Heddon Historical Footprints Book. This journey had proven to be a most successful trip for Mr. Harbin. He gathered hidden information about the Heddon/Stokes families from the present day family members. Mr. Harbin said the Heddon/Stokes Heritage trip was worth every bit of planning, getting there, researching and returning home. 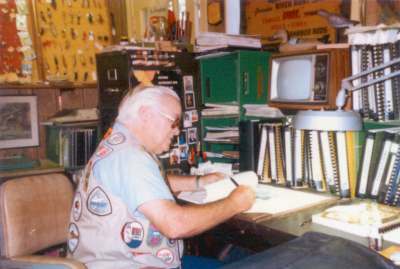 The above photograph of Clyde A. Harbin Sr. is when he was setting up for his first draft of "The Heddon Historical Footprints Book". Mr. Harbin has traveled hundreds of miles and met with remaining family members of the Heddon and Stokes families. He unburied hidden information and assembled this information in this hand assembled book . Mr. Harbin has done over thirty years of research on the Heddon family and the Heddon/Stokes Heritage journey was a most successful mission. It took Mr. Harbin more than ten years to arrange and assemble his Footprints book. July 18, 19 &20, 1986 Tim Watts the grandson of Clyde A. Harbin Sr. (The Bassman) attended the Natchitoches - Northwestern Folk Festival. Tim is a lifetime member of the NFLCC and has been involved with antique lures since he was a toddler. Now as an adult Tim has grown into a very knowledgeable lure collector. (left) Chuck Heddon (right) Clyde A. Harbin Sr. 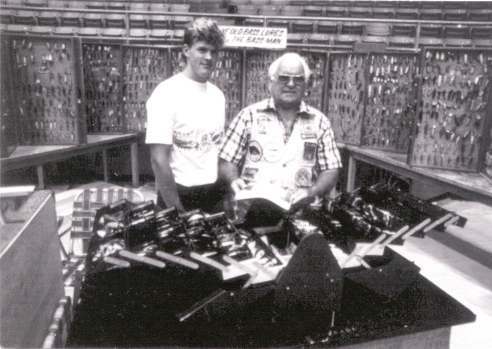 This was Chuck Heddon's First National Fishing Lure Collectors Club's swap meet that he attended on September 20, 1986 in Atlanta, Georgia. Sitting along side of Chuck Heddon is Clyde Harbin. They are holing up 1947 picture of Laura and W.T. Heddon, Chuck's grandparents. Chuck Heddon is a pilot and flies overseas for the Fedex company. He had twenty-five replica's made in the Philippines of the Flying Jenny. The Flying Jenny was the plane the Heddon Company used to deliver Heddon baits and tackle to customers. 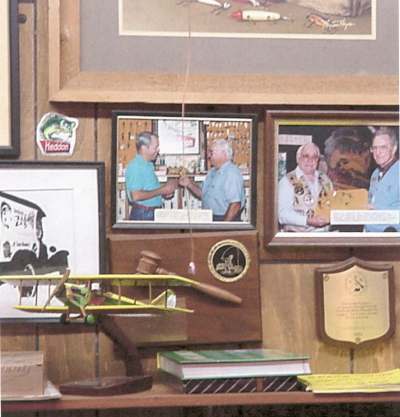 Chuck Heddon presented Mr. Harbin with a gift of the no.2 replica of the Flying Jenny. In December of 1986 Mr. Harbin along with Phil Smith of Phil Smith Productions shot his first Heddon video. He now has a library of Heddon video's that they made over the years. In the year 2000 he released his ninth and latest video "Heddon Historical Footprints" which covers the Heddon Heritage. There is Bee Keeping information, Jeanette Hawley, Abbey & Imbrie, VL & A, EDW K. Tryon Co. information, Box and early Rod information along with much more Heddon information. 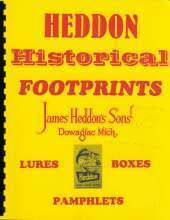 This video relates to The Heddon Historical Footprint book and has Heddon information that has been discovered after the Footprints book was printed. Clyde has always helped others in the field of old lures. He provided many color slides for the book "Collectors Guide to Antique Fishing Lures by Silvio Calabi". One of the slides was an 1898 Super Rare Heddon Wooden Frog that was hand carved my James Heddon himself. Clyde at one time had two of the Hand Carved James Heddon Frogs in his collection. He acquired the second Heddon Frog from friend Larry Wysong who got it from an antique store. Clyde later swapped it to his friend Clarence Zahn who needed it for his Heddon Collection. 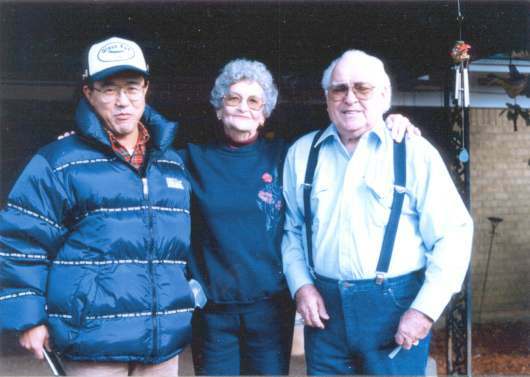 (left) Mr. Mitsuru Sato (center) Mrs. Polk Harbin (right) Mr. Clyde A. Harbin Sr. This picture was taken December 12, 1997 upon the arrival of Mr. Mitsuru Sato (adviser), Mr. Takaharu Hirano (editor) and Mr. Taku Miyazawa (photographer) of the EI Publishing Co. Ltd. They visited Mr. and Mrs. Harbin at their home in Memphis, Tennessee. 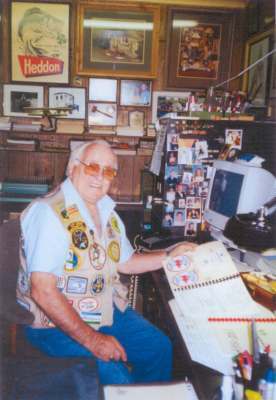 Clyde was helping them with Heddon information and lure pictures from his collection for the First Edition of the "Old Tackle" magazine. 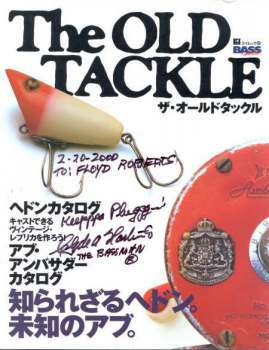 Clyde Harbin and Mr. Sato are discussing what lures the EI Publishing Trio would desire to photograph for the first edition of the Old Tackle Magazine. Below is Mr. Harbin sitting at his newly remodeled desk after he installed his computer in December of 1999. To make room for his computer he now stores his old lure information books in another area. Mr. Harbin is widely known by his nickname The Bassman and is registered at the United States Patent and Trademark Office as The Bassman™. He is easily recognized by his retort ... Keeeeppppa Plugggin', which he puts on all his correspondences and printed material. He is also known for his famous Bassman® Quotations. Nothin' Ain't Worth Nothin', Until Somebody Wants It!! Lures aren't made to catch fish, they're made to catch people!! If you get what you want and I get what I want, it makes no difference who gets the best deal!! 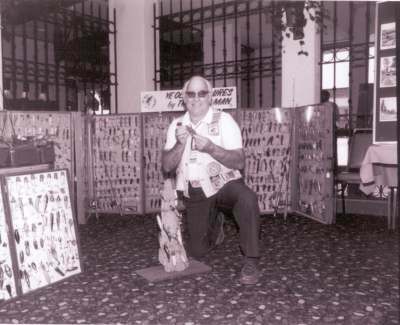 Mr. Harbin is packed with energy and even now in his eighties he is still traveling around the United States giving bass seminars, speaking at collectors events and displaying parts of his vast collection to viewers. He believes that something should be done to save historical items such as fishing lures from being lost and forgotten forever. 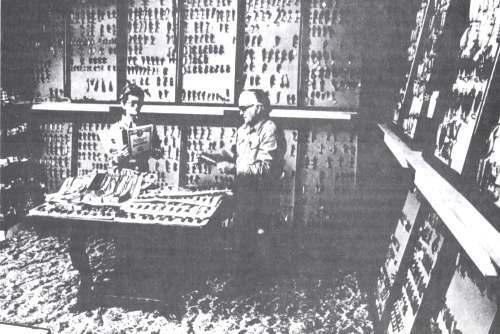 Because of Clyde's love, dedication and research, collectors now can learn about the early years of the development of lure manufacturers. He has done over thirty years of research and is this nation's expert on old lures. the Heddon company and the Heddon Family Heritage. He published his fact filled books, James Heddon Son's Catalogues and The Heddon Historical Footprints Book and went onto filming a library of Heddon Video's. He is a dedicated person in helping others in the field of antique lures and through his efforts and knowledge of this hobby he educated and inspired thousands of collectors around the world. He is considered the nation's authority on antique fishing lures and the most knowledgeable Heddon collector in the world. 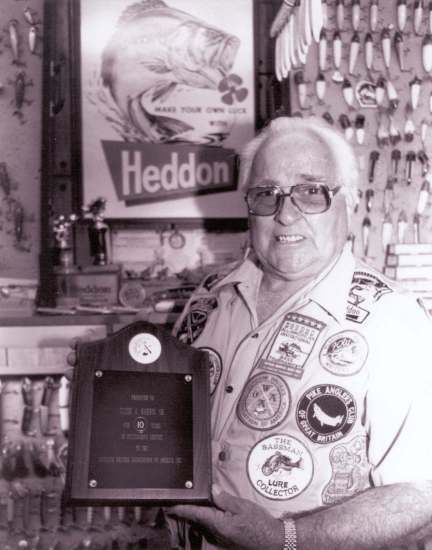 When we think of bass fishing, old lures, fishing relics, fishing tackle company's, James Heddon or the Heddon Bait Company we think of Mr. Clyde A. Harbin Sr. The Famous BASSMAN™.